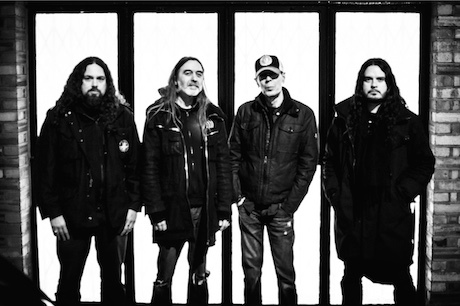 Earlier this month, a black, white and red image tweeted by 4AD suggested that outsider artist Scott Walker was working with drone metal maestros Sunn O))). Today, the details of their collaboration have surfaced. The two entities have become one on a new collaborative album called Soused. The release runs fifty minutes, and includes five tracks. The album features Sunn O)))'s Stephen O'Malley, Greg Anderson and Tos Nieuwenhuizen working with Walker, and was recorded earlier this year. Walker also serves as a producer alongside Peter Walsh and musical director Mark Warman. Sunn O))) initially reached out to Scott Walker with a request for him to guest on their 2009 effort Monoliths & Dimensions. He turned them down, but reached out again in 2013 with new material he had written with them in mind. 4AD will release Soused on September 22. There's a slight variation in the tracklisting between the CD/digital version and the vinyl version. Namely, "Herod 2014" comes after "Bull" on the vinyl, and takes up a full side.